The Montjuïc Cemetery route visits the more representative graves which give us a very important social, historical, artistic and cultural understanding about the illustrious personality buried in each grave. 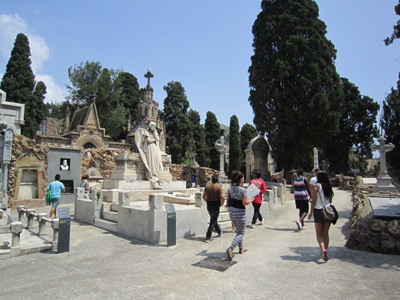 At the same time, this walk through the cemetery shows the evolution of Barcelona during the last 130 years and we will see different topics that meant a change in the social culture of the population. In general, the topics are: modern medicine and public health, the different concepts of man (science/ religion), Modernism in Catalonia, political Catalanism, the projection of Barcelona in the “Pla Cerdà,” icons of Barcelona like the Ametller House or the Batlló House, industrialization in Catalonia, women and thier role as widows, the “Indians” and the American colonies, different social classes and the Spanish Civil War period. Timetable: Monday to Friday, 8 – 18 hours.